ACCESS® VANISH® Roll-Up Cover - Streamlined tonneau cover gives you the look you want at a low price. Protect your truck bed and cargo without sacrificing the streamlined appearance you prefer with the ACCESS® VANISH® Roll-Up Tonneau Cover. 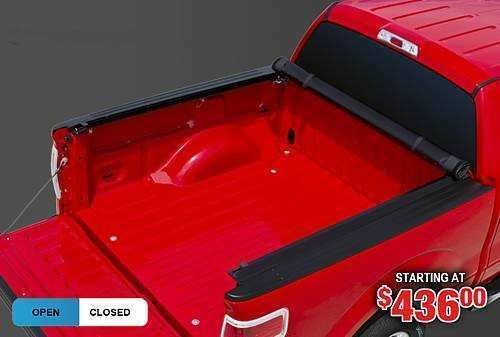 When closed, this streamlined, low profile mount tonneau cover lies a mere 1/2 inch above the truck bed, virtually disappearing before your eyes from the side or rear profile.It will give your truck a smooth, streamlined look while providing you with gas mileage savings and 4-season protection for your cargo. New and improved features of ACCESS® VANISH® includes the XT-Dial™ tension adjuster, Adjustable Storage Straps and the Element Seal™ Gasket. The ACCESS® VANISH® low profile tonneau cover pays for itself in the first 3 years of ownership by boosting your gas mileage by as much as 10%! Easy installation in minutes with our included Tight Bite clamps. Once installed, it takes only moments to open the streamlined tonneau cover by simply releasing the latch and it’s a cinch to close and seal the roll up tonneau cover by using the sturdy hook-and-loop sealing system.